The Cinema Barberini is and always has been a premiere first run house since it was opened in 1930. Located in Rome’s Piazza Barberini, just across from the famed Hotel Bristol, the start of classy Via Veneto, and the Triton fountain by Bernini. The theatre was originally built by director Roberto Rossellini’s father. Designed in an Art Deco style, the original seating capacity of 2,000 was divided into orchestra and balcony levels. The sides of the balcony extended forward towards the proscenium and had a series of stepped loge seating. The side-walls at balcony level had a series of large Art Deco inspired decorative panels. Beneath the balcony, the rear orchestra seating was illuminated by a series of eight troughs which contained concealed lighting. The Cinema Barbarini was equipped with a decent sized stage. It is doubtful if much of the original interior now remains after being sub-divided into five screens, although in the foyer containing the ticket office there still remains a domed ceiling with concealed lighting around its rim. Thanks, Gerald, for information about those bookings at the Cinema Barberini (and Metropolitan) — do you have other titles to share? Here is a photo that shows the Cinema Barberini in relationship to Bernini’s Triton fountain in Piazza del Tritone. 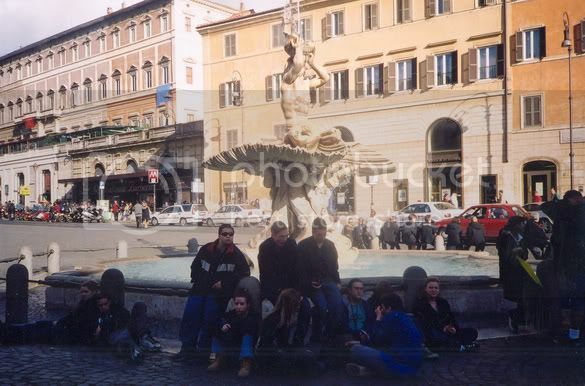 I took it in April of 2001 when leading a group of students around Rome. The Barberini was only caught accidentally in the shot. It is to the left of the photo, behind the M (for Metro) sign. This more recent photo was taken this month. Yes. Superbo. Mille grazie. My life-saving internet-caffe is just to the left of this theater. And to the right, barely up the via quattro fontane, and then just off to the right again on the via Rasella, is the site of the devastating raid in Rossellini’s “Open City,” no? Whether or not R shot that scene on this street (I’ve gotta check it on my VCR), the Nazis did stage a lethal raid there in ‘44. The twentieth, the most brutal of centuries. Yes, I know Via Rasella. Partisans set off a bomb there in March, 1944, killing a number of German soldiers. In reprisal the Nazis rounded up and shot ten Italians (randomly picked, plus any Jews around) for every German. The story is told in the 1962 Italian film “Dieci italiani per un tedesco” and in the 1973 Richard Burton/Marcello Mastroianni film “Massacre in Rome” (“Rappresaglia.”) I don’t think Rossellini shot the round-up sequence for “Open City” there, but it was based on that and other similar Gestapo atrocities. The unlucky Italians were taken to and shot near the catacombs on the outskirts of Rome at a place called the Fosse Ardeatine, the Ardeatine Caves. Then the Germans blew up the caves hoping to hide the massacre. I have visited the beautiful memorial at the caves. I think President George W. Bush was taken there on a visit to Rome. When I visited Rome recently I went to the Allied cemetery for fallen British/British Empire soldiers. It is located inside the Aurelian Wall between Testaccio and Porta San Paolo. Lovely peaceful place, well-maintained, as is the Fosse Ardeatine site. The movie I remember seeing here and would most love to see again but that seems to have entered the legion of the lost is Due pezzi di pane, directed by Sergio Citti, a friend and collaborator of Pier Paolo Pasolini. It had Vittorio Gassman and Philippe Noiret as two roaming musicians, Pippo and Peppe, who unknowingly have the same girl, Lucia. The two return from a prision stretch, the girl dies and leaves a child, Piripicchio, whom they raise with some sad consequences. The film had a Pasolini-esque kind of ribald humor and a fervent melancholy charm that I’ve never forgotten. I saw it at the Barberini on February 17, 1979. A few days later I caught Giuliano Montaldo’s Il giocattolo, starring Nino Manfredi, at the same theatre. The premiere of Vittorio De Sica’s 1951-released Miracolo a Milano was held here. Newsreel footage of the premiere with many celebrities in attendance appeared in the 2001 documentary CosÃ¬ Ã¨ la vita. That is included as an extra (That’s Life: Vittorio De Sica) on the Criterion DVD of Umberto D. Shots of the exterior and interior of the Barberini can be seen. Two movie ads from the Rome newspaper ll Messaggero on March 14, 1941 or XIX, 19th year of Fascism. At the Bernini: Scarpe Grosse/Big Shoes, Dino Falconi, 1940, with Amedeo Nazzari and Lilia Silvi. Starting tomorrow at the Barberini: La prima donna che passa/The First Woman Who Passes By, Max Neufeld, 1940, with Alida Valli. These were the only movies with display ads, but the film listings had over sixty theatres listed with the titles and times of films playing. In addition to Italian films there were many French titles and some American movies, including Ombre rosse which was John Ford’s Stagecoach with John Wayne and Claire Trevor. American films would be blocked by year’s end with the declaration of war between the two nations shortly after the Pearl Harbor attack. 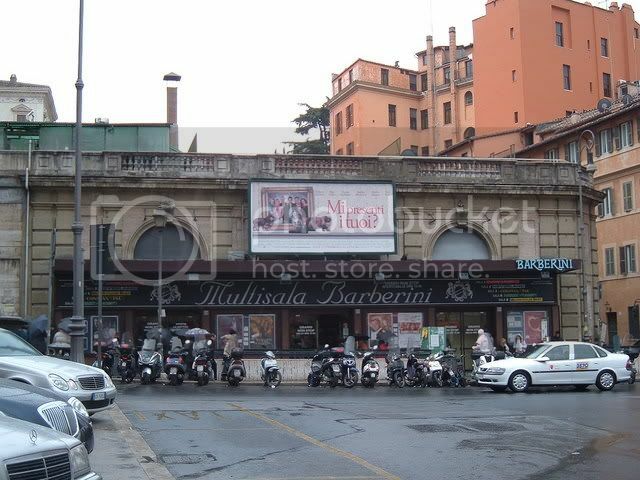 The Barberini is now a multiplex called Multisala Barberini and still thrives on Piazza Barberini. It was at one time owned by Roberto Rossellini’s father. I do not know where in Rome the Bernini was located. Actor Alberto Sordi said that after his 1942 film I 3 aquilotti opened at the Barberini, he would pass by every afternoon to watch the patrons going in and out. Someone asked him for an autograph. It was the first one of his life.